Windows XP, Vista, Windows 7. Earlier Windows versions may work. Both Distortion Meter and Function Generator may be used simultaneously. Displays distortion products up the 9th order harmonic. Two audio level indicators to insure the sound card is not overloaded. Selection of sound devices independent of the system preferred sound devices. Ability to print hard copy of results. 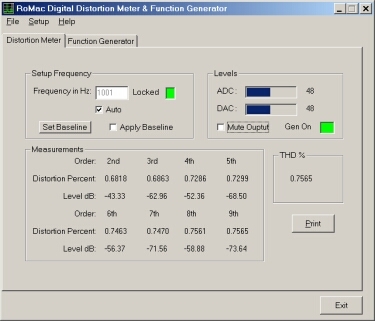 Able to mathematically remove distortion levels of signal generator. Wide pass band 20 Hz to 20 KHz. Function Generator generates sine, square, saw tooth and triangle signals with sweep capability. Combine up to 8 signals of different frequencies and types. Program start frequencies, end frequencies, with a sweep time of up to 10 seconds. Great for two tone testing of SSB gear. Internal controls for Sound Card Levels. Restores all sound card levels after use. Use as Audio Frequency Counter with a resolution of +/- 13 Hz. Requires 16 bit SoundBlaster sound card (See FAQ). RoMac Software is proud to introduce the first affordable Digital Audio Distortion meter for the Amateur Radio Community and Audio Experimenters. Turn your present sound card into a complete audio test instrument. The software also is capable of performing as an audio frequency Function Generator. The Distortion Meter and Function Generator may be used simultaneously. It's like having two completely separate test instruments in one sound card ! Find out whether that audio project has low distortion without spending a lot money on a laboratory instrument. Find whether that last change really did help to lower the distortion of the audio gear. With your personal computer and a 16 bit Sound Blaster compatible sound card, you now have the ability to measure the distortion products of your audio gear. Today's modern sound cards have very low Total Harmonic Distortion. An example is the Creative Labs Audigy 2Z card, which the manufacturer shows a THD of .0004%. Even an inexpensive sound card, such as cards that utilize the Sound Max chipset, lists a THD of typically .003%. The RoMac Digital Audio Distortion Meter has the ability to measure the distortion of the signal source and then mathematically remove that from a test measurement and display the corrected measurements digitally. The RoMac Digital Audio Distortion Meter simple to use. With it's "Auto Lock" feature enabled, the software will automatically lock on the test frequency signal and start calculating the distortion levels. No more fiddling around adjusting notch filters to measure distortion levels. Level indicators on the input and output of the sound card ensures that the sound card will not be overloaded. This will ensure accurate measurements of the distortion products introduced by the device under test. NEW Selections of sound card independent of the systems preferred sound devices. You may also print out a hard copy of all test results. This always helps to document each test after a revision to the circuitry under test. The Function Generator is capable of producing sine, square, saw tooth and triangle waves from approximately 20 Hz to 15000 Hz with variable sweep times up to 10 seconds. You may combine up to 8 signals of any frequency, wave type, and sweep times. Great for two tone testing of audio equipment and SSB transmitters. As an added bonus the Digital Audio Distortion Meter measures the test frequency with a resolution of +/- 13 Hz. It's not a laboratory grade frequency counter, but adequate for many applications for Amateur Radio and Audio Experimenter's. You may choose to have RoMac Software notify you of any updates that become available or by using a simple menu choice you will be able to check for the latest version. The free evaluation software will run for 5 hours of cumulative run time. Purchase License Key for the Digital Audio Distortion Meter $29.95.